020 – Crocodile Dundee | All Eighties Movies. All The Time! G’day mates! This week it’s Australia Day so in honour of that we look at one of the biggest movies of 1986, Crocodile Dundee. Now podcasting with genuine Aussie Accents! Crikey! This entry was posted in Podcasts and tagged action, aussie, comedy, croc dundee. Bookmark the permalink. One of my favourite Aussie movies of all time. Loved the pod cast. Thanks Angry and Gidget for great review. Dreading the Hoges series on Ch 7. Could not agree more. Looks horrible. 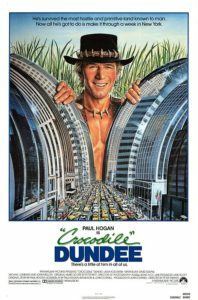 Due to your podcast I’m going to watch Croc Dundee again plus been looking up The Paul Hogan Show on You Tube! Thanks for advice. Fun pod cast too! Agree about land ownership. No one ‘owns’ it.